-Players rally on a full court. 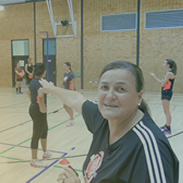 -There can be two or more players on each side of the net starting from the baseline. 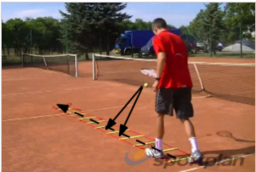 -Using one racket per team the first player hits one shot and passes the racket to the next team player. -Points are won if the opposing side hits the ball outside of singles court or into the net. The drill can be adapted according to players ability by using a slower ball or a smaller court. The drill develops movement and dexterity and encouraging co-operation.